The Fluttering Embossing folder was sitting out on my workspace, so I decided to use it on today's card along with the Elegant Butterfly punch. I used the Fluttering Embossing Folder on Mint Macaron, and added DSP from the free Sale-A-Bration Carried Away Designer Series Papers. I used one of the Stitched Shapes Framelits to cut the Carried Away DSP and then cut off one edge. The two different sentiments are from Flourishing Phrases and the other is from Wetlands stamp sets. I love having general-purpose cards on hands for last-minute needs. I stamped the envelope using the stamp set that matches the Elegant Butterfly punch, Papillion Potpourri. Why is the April Paper Pumpkin kit a must-order? Its a special kit inspired and designed by Stampin' Up! CEO, Sara Douglas, and it includes a free gift. Sara's style is "bold, vibrant and artistic, with a little bit of sass." Get ready to embrace your inner artist and skip to the fun with the April kit. - A monthly, all-inclusive craft kit that arrives at your door. - Craft where you want and at a time convenient for your schedule. - The surprise factors; including Sara's free gift this month. What do you think the free gift will be? They're keeping it a surprise, but my guess is it is something from the new catalog coming out in June. What's your guess? Did you miss the March kit? Great kits like the Bunny Bunnies March kit sell out fast. 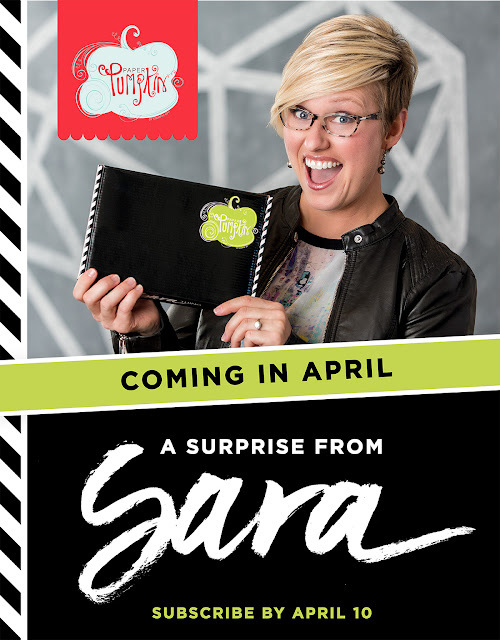 Even though I haven't seen what's inside the April Paper Pumpkin box, I know Sara's style, so I know I'm going to love it! Don't miss out! Sign up by April 10 in order to receive the kit and your free gift. Your kit will arrive around the 20th of April. I'm looking forward to an early peek at the April kit and free gift during Stampin' Up! OnStage event, April 9, but we'll be under embargo until announcement day. This is one kit I can't wait to see! You might want to update your order for more than one kit. Sign into your Paper Pumpkin account and update your order to 2 or more to give as a gift for a crafty friend, sister or mother. What better Mother's Day gift than an extra kit for you and your mom, sisters and friends to spend an afternoon together crafting your kits!? Log into www.paperpumpkin.com to update your April order. Or Sign up, now, so you don't miss this great Paper Pumpkin kit. Sign up today for a 1 month, 3-month subscription, or 6 month and you'll receive your first kit around April 20th designed by Sara Douglas, Stampin' Up! CEO. Grateful Bunch and Punch from Stampin' Up! Flower Shop pansies set from Stampin' Up!